In infant primates, the combination of looking and reaching to the same target is used to establish an implicit sensorimotor representation of the peripersonal space. This representation is created incrementally by linking together correlated signals. Also, such a map is not learned all at once, but following an order established by the temporal dependences between different modalities, which is imposed by the choice of the vision as master signal. Indeed, visual feedback is used both to correct gazing movements and to improve eye-arm coordination. Inspired by these observations we have developed a framework for building and maintaining an implicit sensorimotor map of the environment. 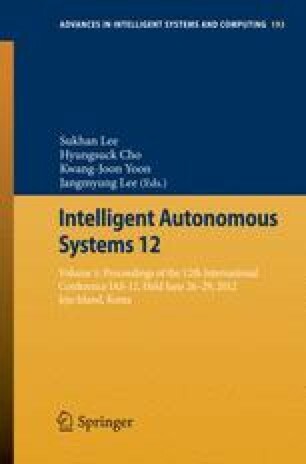 In this work we present how this framework can be extended to allow a humanoid robot to update on-line the sensorimotor transformations among visual, oculomotor and arm-motor cues.